Only two weeks! So sad! It was such a pleasure to discover this magnificent house on the best beach in Sri Lanka. Loved it all -Gorgeous villa, pool, delicious food and delightful staff. Just perfect! Incredible staff, incredible food, incredible accommodation. Out of this world setting. Perfect Stay! Coming back next year. Already booked. What an incredible time in paradise. World Class! Samudra must be one of the most beautiful houses we have ever had the pleasure of staying in. Spectacular setting. Any expectations were blown away by Samudra. What a fantastic place and such a fabulous holiday. We will be back. This was the most relaxing family holiday we have ever had. A lovely villa in a fabulous setting on the beach. But it is the attentive and friendly staff that made the difference. We were able to focus on our children and they took care of us. Ruwan was truly a pleasure, helping with all of our plans and then cooking restaurant quality food every night. 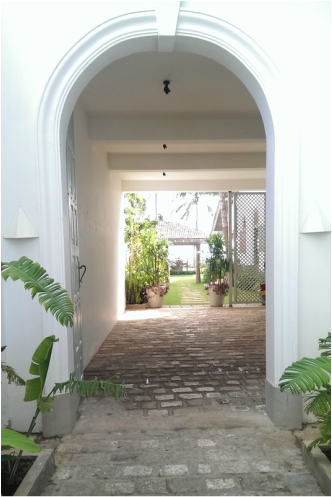 The villa is well situated to explore from Galle Fort to the safari park of Udawalawe. Or indeed just relax by the pool and on the beach. Our kids loved the place and our eldest didn’t want to leave. He loved being able to swim in the pool after his morning pancakes and then play in the sea in the afternoon. We can’t recommend this place highly enough, especially if you are looking for a truly relaxing family holiday. Villa Christine is a piece of paradise on earth. Nature and beautiful beach with the finest details of all parts of the villa. Spending a holiday in this villa with your loved ones will make you feel very happy. At first I was amazed that places like Samudra featured on Airbnb. The pictures are very accurate to the real experience. Before arrival: very good and timely communication from Christian. He put us in touch with established chauffeurs who collected us from our previous location in Kandy in a very decent air conditioned people carrier. We were sent menus that the house chef was able to prepare. On arrival the house team were all assembled and gave us a refreshing drink and showed us around the property. The property is actually better than it comes across in the pictures. Two identical double bedroom suites and plenty of sitting area. We took all the local tips from Ruwan, the chef and team lead. Whale watching and Galle Fort all within easy travelling distance and again used the same driver. The meals prepared by Ruwan were genuinely outstanding and the best we enjoyed throughout our time in Sri Lanka. We didn’t use the menu, just took his recommendations for a varied local meal in each occasion. This includes fresh fish bought from the local fish market. Ruwan and his house team are wonderful human beings and made the trip way beyond expectation. An absolutely wonderful property and experience - totally recommended. Just go! A fabulous spot with great amenities, decor, location and true waterfront (you literally could not be closer). The staff cap it though. Impeccable service from all and superb food from Ruwan the in house Chef. Private accommodation. Very stylish and homely. Staff are Unobtrusive. The service and Location are simply outstanding. Spectacular property right on the sand. From start to finish a wonderful experience. My first ever 10/10. The food is Wow!. Lovely Staff and we will be back. Absolutely amazing. Fantastic location, right on the beach, very private, isolated from the Matara Rd. so quiet and peaceful. Beautifully designed and decorated. Christian is very professional and helpful. Ruwan is great cook and polite and very honest (which is rare). He does Sri Lanka best egg hoppers, grilled mahi mahi, mango salad and many more. Can’t tell you how much we have enjoyed our stay here. Beautiful villa on a beautiful beach. Special mention to the boys - the food has been one of the highlights of the trip. The villa is crying out to become a beach club! All perfect thank you. Once you’ve been you’ll keep going back. We do! We can’t fault it, we love it, already looking forward to the next visit. Wonderful two bedroom beach house with a great pool. Very nice staff, excellent cook and perfect location for a family with children. We will go again! It's reassuring to book a villa that is everything it advertises and more. The garden leads onto a perfect white sandy beach and the villa has been beautifully designed and super comfortable. The staff made it even better - nothing was too much trouble and the food provided by chef Rouen was outstanding. We definitely plan to return. Wooza! Without question the loveliest villa in Sri Lanka. A wonderful, kind and sweet team at Samudra House. Great food. You did everything to make out stay comfortable and lovely. What a wonderful end to our fabulous two weeks. Superb food, great service. A truly lovely house. A magnificent stay at this beautiful house. Samudra was amazing. The food even better. Anything that we requested was done to an outstanding quality. Beautiful home in a fabulous location. Food was so delicious we only went out once! We had a wonderful time here. Aesthetically, culinarily and sensorially – Samudra hits the spots. We are already planning to return. Absolutely amazing, great villa, great staff, great food. We had a wonderful relaxing 4 days at Samudra House at the end of our trip to Sri Lanka. It's right on the beach, but the water was too rough for swimming, so we spent most of our time in the pool, which was huge for three of us. The villa has two bedrooms which can sleep anywhere from 3 to 6 people. There's plenty of space. A night watchman keeps us save at night. In the day, it's staffed by three - a laundry lady, a handyman and Ruwan the butler/chef. He cooked some amazing meals for us - chili crab, grilled garlic prawns, avocado salad, grilled chicken, curry and my son's favourite spaghetti carbonara. Not forgetting hoppers for breakfast! Just tell him what you want, and he'll do the shopping and cooking. When you get tired of lazing around the house, Galle Fort is a half hour drive away. If you need essentials, there's a Food City 10 minutes walk away. Highly recommend! Stunning beach house , brilliantly looked after by fantastic staff, great location, and the perfect last five days in beautiful Sri Lanka..... Ruwans cooking was exceptional and we loved every minute of our stay and we dreaded returning to the real world. I just wanted to say that we have had the most wonderful time at Samudra. You have created the most incredible home and the team here are wonderful. We will come back if you'll have us! Bliss-Stunning beach house , brilliantly looked after by fantastic staff, great location, and the perfect last five days in beautiful Sri Lanka..... Ruwans cooking was exceptional and we loved every minute of our stay and we dreaded returning to the real world. Paradise on Earth-We loved the villa! It's a beautiful property and the location is great. The staff is wonderful. We will definitely come back! We had the pleasure of spending 4 nights and glorious perfect days at this villa near Galle. It was so good we didn't even go to Galle forte , and only ate one meal out at another so called fabulous restaurant but found it couldn't even half compare to the meals our wonderful chef cooked at Samudra. Divine staff, smiling, always "present" in a service ,orientated non intrusive way and amazing amazing chef. We've stayed in some incredible hotels and properties and Samudra is right at the top. We stayed as a family with our 3 children aged 13,17 and 18 yrs- the best family holiday Yoga each moring by tuk tuk at a fabulous local studio,and once in the villa. Massages in the villa and at a local ayruvedic one within walking distance. My boys went surfing with a local instructor and lots of eating and relaxing! Second time I visit Samudra because the first time was not enough. Visited Samudra Dec 2015 and came back Dec 2016. Everything is amazing the villa is so cozy and clean. Ruwan cooks the best meals ever we only ate out for one meal in 9 days!! Sanjeeva is great too always helping out when needed. We felt very safe with the security who stayed all night. The location is perfect close to everything in the south. I can't wait to come back this place has a special place in our hearts. Thanks for this experience. Samudra is paradise on Earth. Beautiful villa in a great location right on the beach, 5mins walk to a turtle hatchery and 20mins tuk tuk rom Galle. The villa is well equipped and best suited to 2 couples or a young family. There is a loft bedroom but it is separate from the rest of the house and bulit for a maid. The in-house staff are wonderful, always available but never intrusive. Make sure to have a meal prepared by the in chef, fantastic. We stayed at Samudra as a family of four, on our annual holiday together, and had a wonderful time. The location is perfect, right on beautiful Habraduwa beach, with a turtle hatchery just a few minutes' walk away along the sand. Galle Fort is 15 minutes away by car and definitely worth a visit when you can tear yourself away from Samudra's poolside. The weather during the low season of August had been a concern, but we had gorgeous blue skies, sunshine and a nice breeze every day. The villa was very well kept and the design is lovely, with a large open living room and comfy bedrooms. The staff were fantastic - especially Ruwan, the cook, for whom nothing was too much trouble. (We recommend his veggie soup and chili crab!) We also enjoyed a visit from Henri, the villa manager, who was full of tips about the local area. If you're planning a trip to southern Sri Lanka, we would absolutely recommend staying at Samudra. We felt very well taken care of and the value for money is spot on. (We were told the owners are building an extra bedroom, so the villa will be able to sleep up to 6.) The only (small) downside for visitors looking to stay here in the next few months: There is a fair bit construction noise from the property next door, and from the other side there tends to be some smoke when piles of debris are burned. Not as bad as it might sound, and more than made up for by the great experience overall. We are already planning our return! This place is like paradise! Fantastic, very harmonious interior design, nothing too much, nothing too less... some tasteful antiques create a great atmosphere. Beautiful garden with refreshing pool and ocean view. Very friendly, helpful staff, a gifted chef who can fulfil quiet every gourmet wish shopping daily fresh ingredients. The rooms are huge, with an outdoor bathroom and a bed for cozy cocooning. An amazing tropical beach invites for long walks, no harassment of beachboys or wild dogs, just perfect for relaxation and nurturing the soul. The famous Galle fort only a 25 minutes tuktuk-drive. Beware, you will become addicted! Everything about Samudra Villa makes you want to return. The first view of the house and view from the house catch you by surprise..the architectural splendour of the house, the elegant furnishings, the stunning beauty of the location, all weave a spell on you ... And then there's Ruwan and Sanjeeva; the courteous, unobtrusive, extremely accommodating, and good natured staff. Ruwan can weave his own magic with the food. His 'pol sambol', curries, and 'gotukola salad' are a Sri Lankan's dream. Borrowing the words of Wordsworth, Galle "has not anything to show more fair"... We will return. Samudra is stunning! The house is spacious and beautifully decorated - no detail has been left to chance and there are a lot of nooks and outdoor seating to read, relax and nap. The location is simply incredible - right on the beach although there is also a pool overlooking the ocean. It is without a doubt the most magical place I have ever stayed at. Cannot recommend it enough. Really and truely paradise right here, I can't express how lovely the villa is and its surroundings. The beach outside the villa is stunning, the villa itself is beautifully designed and the staff are perfect. A holiday rental like no other. The location is super, near to Galle and not so far from Weligama, right in the middle of Sri Lanka's favoured South coast. After an amazing trip to Samudra last August I returned this April with friends, for 10 days of relaxation in the sun. The house itself is gorgeous, designed to ensure you spend the majority of your time outdoors enjoying the sound of the surf and the amazing view, which alone is enough to make you fall in love with the place. Inside, the bedrooms are spacious and airy with extremely comfortable four poster beds and private outdoor showers. The team at Samudra are exceptional and could not be more helpful to ensure you truly relax and switch off from the world! Wow. This really was an amazing place to spend a week. The villa is so close to the sea that you hear the waves lapping in as your head hits the pillow in a large and airy bedroom with a huge 4 poster bed. Opening your bedroom door in the morning to an empty beach with palm trees beautifully littered along the coast line doesn't get boring. If you want somewhere beautiful, quiet and ultimately relaxing, this ticks all the boxes. You'll also be served amazing food by the charming chaps who work at the villa. Fresh fish, prawns, squid, light curries and dhal and make sure you get hoppers for breakfast. Finally, the villa is in a great spot for day trips out to Galle fort, Mirissa beach, diving and whale trips, and if you fancy a bit of a night out Unawatuna. Can't wait to go back next year! Samudra is my happy place - everything is beautifully decorated, the outlook is stunning, the pool is perfect, and the staff will look after your every need. Samudra boasts one of the best chefs who will cook whatever you ask with fresh, local ingredients. Waking up to the sound of the waves is such a privilege, and the garden, beach and pool mean you are spoilt for choice about how to relax. I've stayed over five times now, with friends and family from all over the world, and Samudra is always their Sri Lankan highlight. I'll be back again soon! Following a magical time at Samdura House last year my partner and I couldn't resist returning for another 10 days and have left again with only WOW. The garden, pool and beach are as beautiful as remembered and it was great to see both Ruwan (we resp recommend his rice and curry and range of fresh salads) and see Sanjeeva, who was as helpful as ever. Everything is done for you here, all you have to do is relax and admire the view of the garden wildlife with daily visits from exotic egret birds, turtles, chipmunks etc and the beach, which apart from a handful of surfers feels private it is so secluded.. The addition of day bed facing out to sea for afternoon snoozes and additional pieces of antique furniture and art make for it as close to perfection as I have every experienced. Its a place to go to unwind and find tranquility and we are already looking at dates for next year. We had such a fantastic stay here, visited because a friend highly recommended it and we were not disappointed. The staff onsite were amazing and the food was second to none. Nothing was too much trouble. The villa itself is beautifully furnished, the little touches like books, board games and tourist guides make such a difference. Would recommend this to someone that wishes to relax in beautiful beach side surroundings. This place has it all! Set within a beautiful stretch of pristine coast line with lush tropical vegetation sprawling onto the golden sand, it really is paradise. The house itself is simply exquisite with everything one could possibly ask for to complete the perfect stay. The high end Sri Lankan interior design throughout the property rivals that of any top end hotel resort with the attention to detail adding a certain flare I have not experienced before; whether that be the ice cold flannels handed to you upon arrival scented with the most amazing fragrance to the flower petals dotted across the bed it really is an experience that is a must for anyone visiting this amazing country. A true highlight are the wonderful house staff who can be on hand throughout your stay to make your trip even more comfortable. I would highly recommend staying in and having the on site chef cook for you - his garlic and chilli prawns are to die for (his famous chilli eggs are also a must try at breakfast!). This place serves as a great place to simply kick back and relax for your entire stay or use as a great base given its convenient location whether you fancy a jungle safari, trek up Adam's peak or some whale watching! it really is too good too good to be true - I couldn't recommend it enough. This place is perfect. The villa is so comfortable, the view is unbelievable especially at sunset. Just a magical place to spend your days.... But the real gem, the Staff! The nicest, most friendly people and the food is out of this World. Still dreaming about the prawn curry. Will be back soon. Samudra is seriously beautiful. Henri gave us a little run down of the history and I think you guys have done an amazing job. The staff were warm but not intrusive and the food was possibly the best we had on the entire island. The villa is designed to perfection. It looks like a home from a design publication whilst still maintaining an incredible warmth and cosiness - we felt at home. The location is perfect - water views from every room and close enough to all of the sites I will be recommending Samudra to anyone I know who is visiting Sri Lanka and I certainly hope to return. I couldn't recommend this villa enough. Set on the most stunning beach, with an insane view of the sea, it is without a doubt the most beautifully designed and decorated villa I have ever been to. With large open spaces, huge bedrooms, cool bathrooms, a lovely sized pool and garden it was complete and utter paradise. Above all we were spoilt rotten by the wonderful staff who went above and beyond to look after us. The food was delicious and the choice immense. All in all, it was a thoroughly enjoyable stay which we will remember forever. Thank you so much for literally making our trip in Sri Lanka! The villa is beautifully decorated, very relaxing atmosphere and feels very homely. As a young married couple who were on honeymoon the warmth of the staff was excellent. Ruwan is an amazing cook. The food we had there was the best in whole of Sri Lanka. We were referred to this property by friends and for good reason. This is a hands off, kick back, put your feet up, relax and refresh holiday home tucked away on a beautiful piece of Habaraduwa Beach. The Villa met or exceeded our expectations so much so that we decided we would try and return in early 2016 for another holiday here. The staff were exceptional from start to finish and were only to happy to help out where they could. We ate out once and quickly realised that the best food in Galle is at the Villa prepared by the resident cook, Ruwan. He will listen to your requests, offer suggestions but most of all, he really wants you to enjoy what he prepares for you and that shines through based on the pride that he takes in preparing the meals. He is of course assisted by Sanjeeva, resident handyman, transport manager and jack of all trades. We should not leave out the other 2 members of the staff that helped also, the night watchman and the cleaner. Thank you Christian and Pip for allowing us to enjoy a fantastic week at your little slice of Paradise. We can't wait to get back there. I stayed at Samudra Villa in early September 2015 for a week of downtime and relaxing. It couldnt have been more perfect. On arriving at the villa, I didnt want to leave (in fact I only left twice in the whole week) I think this may be the best spot in the greater Galle area. The staff did a wonderful job - cooking delicious meals and making arrangements for anything I needed. I spent the majority of the time by the picturesque pool. To say it was relaxing is an understatement. Absolutely amazing villa looking straight out onto the Indian Ocean. We spent the days sipping fresh coconut water and enjoying the delicious food prepared by Ruwan. With its charming features, picture perfect surroundings and unrivaled location, I'd recommend Villa Samudra to anyone in a heartbeat! This is like a slice of Heaven.I would like to take Samudra home with me.The design,the style,the decor,the details,the Garden,the beach,The Pool..absolutely gorgeous . What a wonderful place.Everyone was so warm and hospitable.Food better than Aman.We will never forget our stay. Absolutely amazing !! We enjoyed everything about this place.! "You have a beautiful house, in a stunning location, with wonderful staff. Ruwan, Sanjeeva and Suzi were all outstanding. We can't recommend Samudra House enough and will certainly return for another relaxing week next year"
Thank You so much for a wonderful time.What A beautiful spot! Beautiful villa and fabulous staff.Paradise !! One of the Most Wonderful Weekends.The Villa,The Beach,The View. Thank You so much for a wonderful getaway.The atmosphere and Food was absolutely delicious! "Your house is beautiful, the staff were exceptional, the weather was ideal, the food was delicious, the laughing was endless... what more could you want on holiday - in fact, everything was perfect and I simply cannot explain how grateful I am to have stayed at Samudra in such lavish comfort, we all felt extremely spoilt"
"Wow,The most beautiful villa I have ever stayed in"
The staff were exceptional and they provided the best teamwork of any of the houses we have stayed in in SL.Nothing was too much trouble and you did not have to tell them anything twice.Once we sorted out the problem of my best red wine going in the fridge everything was fine! The food was really good and for once in Ruan we had a chef who was able to cook what he said he could,quite unusual. We are definitely coming back next February !" "Your house is a dream! We were looked after so well, Ruwan's cooking was superb, and Sanjeeva always had our rooms tidy and clean. The house looked so beautiful. So this is really to say huge thank you s for letting us stay in your beautiful house, and I hope we can go back. I will be recommending the house to any friends as it really is a holiday of a lifetime staying in your house. It is beautifully decorated." "A breathtakingly beautiful beach escape which takes open plan, open air living to another level - sophisticated, stylish, soothing and serene. Possibly the best pool in the world." "We absolutely loved Samudra. We were the first people to stay. It was gorgeous!" "I have enjoyed a really wonderful holiday at Samudra. A beautiful house with a breathtaking view of the beach and it was lovely going to sleep to the sound of the waves." "Absolutely the most beautiful villa I have ever stayed in.Overwhelmingly beautiful." "We had a fantastic time! Henri was great,the staff delightful and we loved caramel. The Food was delicious and we loved that we had such an easy access to a lovely part of the beach for walks and swimming. I will definitely be coming back."